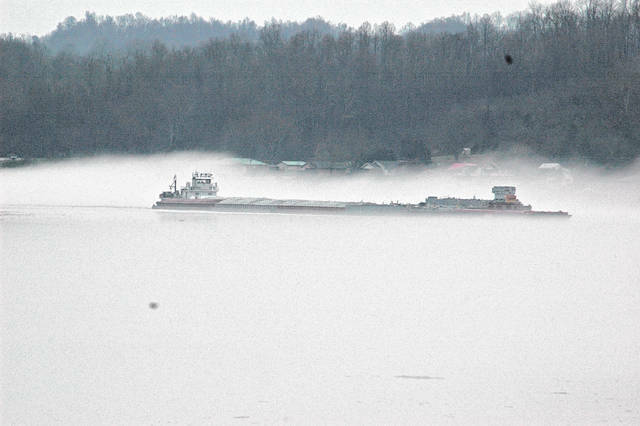 A chemical barge works it way up river in the midst of thick fog on the Ohio River Thursday morning. OHIO VALLEY — With the changing temperatures and spring moving in, fog has become a regular sight in the region. While many know that fog is essentially a cloud on the surface, many are unaware of how and why it forms, and why it is so prevalent in our area. During the spring season there is notably more precipitation, which can also induce fog when the temperature drops until it meets the dew point, which is the temperature at which the moisture in the air condenses creating fog. According to Zvolensky, the heavy precipitation and wide swinging temperatures are excellent conditions for fog to form. “All of the creeks and rivers around here provide a lot of moisture for the fog, when the temperature and dew point get close, it becomes 100 percent saturated and fog will start forming,” said Zvolensky. However, this is only one type of fog, known as advective fog. Advective can be formed through heavy precipitation and the mixing of warm and cold air, but is also can manifest itself due to our terrain. “Since our terrain is so mountainous and hilly, upslope fog can be caused by the winds pulling the moisture up the sides of the hill on the windward side and that causes the air to expand and cool, forming fog,” said Zvolensky. Another kind of fog that occurs in our area is radiation fog. During the day the sun emits radiation that the surface absorbs, and it escapes back into the atmosphere at night creating a cooling affect. According to Zvolensky, as the temperature continues to drop it will eventually meet the dew point, causing the formation of fog on the surface. While fog is largely harmless, it is most common near bodies of water in the early morning before the temperature begins to rise. Numerous factors can play into the presence of fog, including wind variables, temperatures, and precipitation.